Gerónimo Rulli, the goalkeeper Manchester City signed last summer, immediately loaned out, then sold to Real Sociedad in January, still dreams of playing for Pep Guardiola’s side. It was a very confusing deal that made sense on several levels for City, but still had fans scratching their heads. 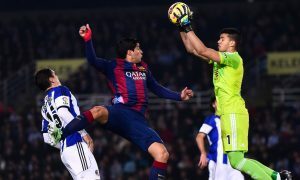 And with Claudio Bravo continuing to struggle, many blues on social media called for City to recall Rulli in January. Unfortunately for them, Real Sociedad had a fixed obligation to buy the 24-year-old in January and now own his sporting rights. However, City have an option to buy him back for €14 million until 2018, and if they fail to, they are due 30% of his next transfer fee. Speaking to Gol Televisión, Rulli has admitted that he still harbours ambitions of playing in the Premier League, specifically for Manchester City. He spoke of the complex transfer deal, which saw him finally end up at Real Sociedad permanently last month, and admitted he had been close to joining City properly (as a member of the squad rather than a registered player). Rulli will have to work hard to get a move to the Etihad, because to buy him back, Manchester City will have to pay double what they sold him for. To justify this, they will need to be convinced he has developed into a top-level goalkeeper, and with others, such as Ederson Moraes linked with a move to the club, it could be hard work for Gerónimo to realise his dream.